As the name suggests, the Big Cypress to Fisheating Creek Critical Linkage connects Big Cypress National Preserve (and Everglades National Park) to the Fisheating Creek conservation lands complex, Bright Hour Watershed conservation area, and Babcock-Webb Wildlife Management Area. The entire linkage is approximately 775,000 acres, of which 14 percent is currently under conservation. This project is considered by the Florida Department of Environmental Protection (which oversees the Critical Linkages in cooperation with the University of Florida GeoPlan Center) to be one of the top three most important ecological linkages in the state. It incorporates most of the Florida Fish and Wildlife Conservation Commission’s Strategic Habitat Conservation Area for the Florida panther. Protection of this landscape is essential for the long-term survival of the Florida panther because it includes lands north of the Caloosahatchee River, where the establishment of a breeding population could dramatically improve the outlook for the species. Read more at “Through the Lens” here. Given the enormous size of the Big Cypress-Fisheating Creek Critical Linkage, it’s surprising that its viability is so narrowly dependent on one particular Florida Forever BOT project. 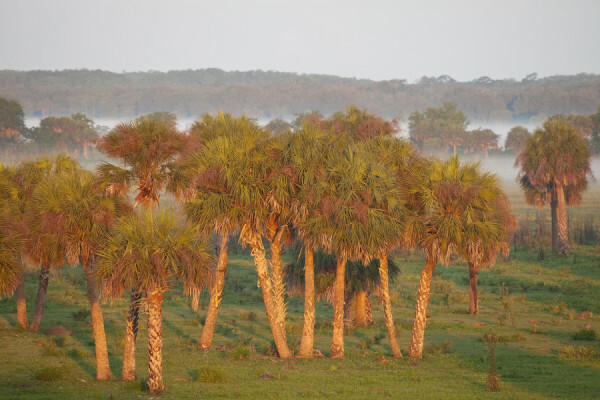 The Caloosahatchee Ecoscape Florida Forever BOT project extends from the Okaloacoochee Slough State Forest conservation land complex to the Caloosahatchee River, roughly 4 miles east of LaBelle, Florida. The status of the landscape connection is tenuous. The project boundaries are as narrow as 1 mile in places, which some ecologists suggest as a minimum threshold for movement corridors for wide-ranging species such as a panther or black bear. The width of forested habitat within the boundaries of the project are often much more narrow than this threshold. Growth pressure from LaBelle threatens to further shrink the passage. The majority of the natural communities on the properties within the Caloosahatchee Ecoscape Project have been impacted by clearing and drainage from improved pasture development or farming. Some of the land has been used for sod farming. Despite the disturbed plant communities, the project provides important habitat for a variety of listed wildlife species beyond panthers. A mosaic of wet prairies, cypress basin and dome swamp, wet pine flatwoods, freshwater marshes and scrub comprise the best habitat on the site. The long-term management goals for protected land within the project will be to restore and maintain native plant and animal communities. Wildlife underpasses on State Road 80 may need consideration in order to improve connectivity within the project. The most compelling reason for the conservation of this property can occasionally be found in the fire lanes and off-road trails, in the form of dusty feline footprints. Male Florida panthers have been documented crossing the project, moving north to the Caloosahatchee and the ranchlands beyond. GPS data produced by collared cats has repeatedly confirmed the use of this habitat bottleneck. In 2012, the 1270-acre parcel owned by American Prime was purchased through a joint effort by the U.S. Department of Agriculture, the Nature Conservancy, the U.S. Fish and Wildlife Service and private donors. The property fronts the Caloosahatchee River, and is the point at which male panthers have been able to access and swim across. As recently as 2008 the property was slated for a residential development, complete with a 200-boat slip marina. Fortunately, a deal to conserve the property was reached before it fell into foreclosure. The Caloosahatchee Ecoscape project is 18,400 acres, of which 6100 acres is currently protected by conservation. Additional protection will require cooperation among agencies and NGOs and landowners, similar to the process that allowed American Prime to be protected. This project remains in the highest priority category.